If you visit the halls of government in most developed countries, you’ll see not just politicians at work, but journalists documenting the decision-making with cameras and computers. But for five days in 2016, the Polish parliament’s debating chamber banned journalists altogether. The Polish parliament’s media ban lifted on Tuesday, December 20, 2016, reports Marcin Goettig for Reuters, but questions about the fate of the country’s free press remained. The temporary ban was lifted after Poles took to the streets to protest. As Goettig and Lidia Kelly reported, tensions flared when the ruling Law and Justice Party announced that in 2017, most journalists would be banned from entering the Sejm, or lower house of parliament. They said that, instead, journalists would be required to interview officials from a separate building. Additionally, they said that the recording of parliamentary sessions would also be banned for most media outlets. 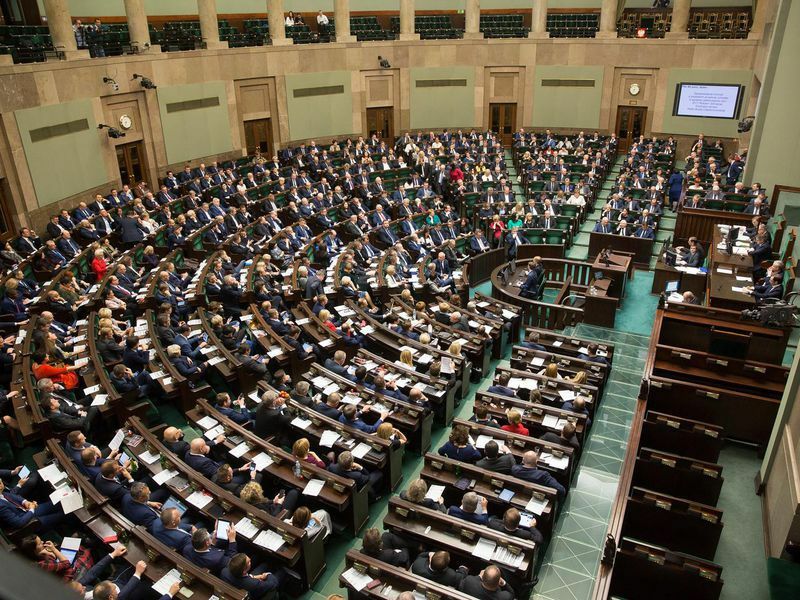 The announcement of the changes caused tensions to flare inside the Sejm. An MP stood on the podium, he held a sign that read “free media,” reported Kelly and Goettig, and he was joined by others which caused the parliament to be brought to a halt. Then, the Law and Justice-dominated parliament did something unusual: They kicked all reporters out of the building, went to a side room and held what the opposition says was an illegal vote on the 2017 budget. That prompted widespread demonstrations just days after the government began cracking down on public gatherings. The timing was sensitive for Poles: December 13 marked 35 years since the country’s communist government imposed martial law, where it jailed and killed its opponents. The target of the crackdown was Solidarity, it was a trade union that became a movement to democratize Poland. During a year and a half of martial law, Poland’s journalists were targeted, and freedom of the press has remained a critical issue for Poles who remember a time when voicing opposition could cost you your life. That freedom has already been challenged by the Law and Justice Party -now the most powerful party in Poland, the far-right party took power after running on a platform that promised Poles a return to conservative values and resistance to globalization and refugees. Soon after taking office, the party began to “reform” Polish journalism, taking over public broadcasting and the hiring and firing of some journalists. The new government also spurred an ongoing constitutional crisis by overlooking existing laws that dictate how the country’s highest court should function. The nationalist Law and Justice Party has been criticized for its attempts to control how journalists characterize Polish history. (As Smithsonian.com’s SmartNews reported in 2016, the parliament moved to ban the term “Polish death camps,” a move some claim ed minimized the role Poles played in the Holocaust.) But for many Poles, closing the door on lawmakers’ once-public debates was a step too far. Members of the opposition staged a five-day sit-in on the floor of the parliament, and continued with the sit-in despite the fact that their opponents turned off the light and heat inside the building, while at the same tim, outside, thousands of protestors - not deterred by the chilly December weather - gathered to make their voices heard. The ban was lifted, but it still wasn’t clear what the Law and Justice Party’s next move would be. As Goettig noted, the party still has support due to a rise in the minimum wage and other social reforms. Onlookers continued to keep a close eye on the situation, including the European Union, which conducted an investigation of the country’s rule of law. The world will continue to closely watch the situation in Poland—that is, if the cameras and computers stay on.